Seven different players scored touchdowns Friday as Carey School celebrated its 2011 Homecoming with a 66-0 eight-man prep football victory over the Richfield Tigers at Derrick Parke Memorial Field. Carey piled up 155 yards rushing and 156 passing yards, opening up a 44-0 lead after one period. The Sawtooth Conference North Division encounter ended at halftime on the 45-point mercy rule. It was Carey's 11th consecutive win over two years. Junior quarterback Jordan Dilworth (10 TD passes season) threw for three touchdowns, and Carey's defense also returned three interceptions for touchdowns—two by sophomore Luis Garcia. Another young Panther player, sophomore Tori Alvarez, excelled on both sides of the ball with 58 rushing yards and 12 tackles. Carey (4-0, 1-0 league) has outscored four opponents 170-16 with five games remaining. Coach Lane Kirkland's defending State 1A Division 2 champions face one of their toughest challenges Friday, Sept. 30 making the long trip to Bancroft in southeastern Idaho for a non-league clash against Sawtooth Conference South Division foe North Gem Cowboys (2-2, 2-0 league). North Gem, led by the rushing of Merrill Hall and Tyler McClain, won 44-28 over visiting Murtaugh last Friday and prevailed 54-40 at Lighthouse Christian the week before. Carey and North Gem didn't play last season, but the teams met six times from 2006-09—Carey winning all six by a combined 268-54 score including two state playoff triumphs. North Gem last beat Carey 48-44, in Carey, back in the first round of the 2005 eight-man football playoffs. 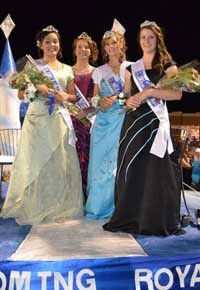 Selected as Carey's Homecoming royalty last Friday were senior queen Micaela Adamson, junior Jaide Parke, sophomore Lilly Rivera and freshman Annie Cline. Rushing—Tori Alvarez 7-58, 1 TD; Dillon Cenarrusa 1-36, 1 TD; Luis Garcia 4-35; Christian Zarate 3-23; Patrick Baird 1-3. Passing—Jordan Dilworth 3-3, 124 yards, 3 TD; Nate Adamson 1-1, 32 yards, 1 TD. Receiving—Charlie Rivera 1-53, 1 TD; Chance Chavez 1-52, 1 TD; Christian Zarate 1-32, 1 TD; Baley Barg 1-19, 1 TD. Interceptions (4)—Jack Cenarrusa 1, Luis Garcia 2, Jordan Dilworth 1. Punt returns—Tori Alvarez 1-30; Baley Barg 1-18. Tackles/assists—Tori Alvarez 12/2, Christian Zarate 5/2, Jack Cenarrusa 4/1, Gunner Thompson 4/1, Jordan Dilworth 2/2, Glen Andrews 3/0, Francisco Gamino 2/1, Chance Chavez 1/1, Patrick Baird 1/1, Garrett Lee 1/1, Chris Peck 1/0, Charlie Rivera 1/0, Dillon Cenarrusa 1/0, Nate Adamson 1/0, Matt Whitworth 1/0, Baley Barg 1-0.